Here's some photos from a couple weeks ago, with Atlas updates. 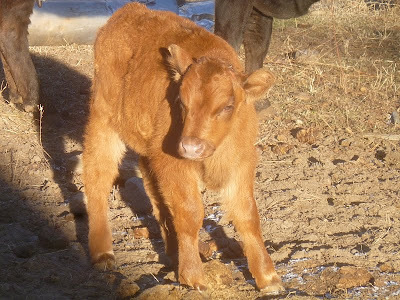 Atlas, if you recall, is our new little bull calf we bought from a neighbor. We brought him and his mama, Lily, home after Thanksgiving, where they stayed inside the barn for a couple weeks until little Atlas's horn buds could be felt and we could dehorn him. Here he is with duct tape over the dehorning paste. ...so they could meet the rest of the herd through the fence. With all this room in the corral, oh my did Atlas run! He stretched out those legs like he couldn't do in the barn. After a couple hours, we opened the gate and let the animals all meet each other. Here Sparky says hello to Atlas. Everyone was curious to greet the newcomer. After awhile everyone got out of the corral, and the chase was on. Partially this was just high spirits, and partially it's establishing Lily, Atlas's mama, in the herd's pecking order. After awhile things calmed down, and Lily and Atlas became part of the herd (here, hanging around with Victoria). Atlas is toooooooooo cute! I will be so happy when we move and can afford cattle...and have the room for them! So, where does Atlas and his momma fit in now within the pecking order. Since she is the momma of the bull, does that move her to the top spot? I know nothing about cattle and pecking orders. I got to say, this blog is just so much fun to follow. Thank You. JanieB. Oh I love this post! Atlas is adorable and most certainly a welcome addition to the farm. Anon 11:33, Atlas isn't a bull yet, he's just a baby. So his mama Lily is at the bottom (or near bottom) of the pecking order for now. That doesn't mean she's mistreated by the others, of course; it just means she'll give way to more dominant cattle at the food bins or other attractions. We'll see if her status changes as Atlas gets older. I have a question: Have you ever tested store-bought butter against fresh churned? In the pan. For baking. Both. I think I'm seeing a higher flash point and less foaming with the real stuff, but was curious as to whether anyone else using butter out of the churn noticed this. MrCachet, I'm afraid I've never compared the two. I seldom buy butter (cha ching!). When I'm milking, I make my own butter. When I'm not milking, I buy margarine. Sorry I can't be more helpful! Just ran across your blog, Atlas is so cute! We just picked up a couple of little ones this past weekend and have to do the same to them. Can they run into any problems when the paste is used? I have not seen this done before. Kim, why don't you email me privately at patrice@patricelewis.com ? I have some info on dehorning I can send. It must be done correctly or you could run into some serious problems.